How do you bring together diverse information and intelligence from professionals around the globe so it can be easily shared? That was the challenge facing Help the Hospices, the national charity for hospice care and a member of the Worldwide Palliative Care Alliance. Our chief executive, David Praill, would often receive emails from palliative care organisations across the world – all offering very valuable information to those working in the field – that he thought deserved to be shared more widely. He envisaged a forum that could provide organisations with the means to interact, collaborate, inspire and share expertise effectively. 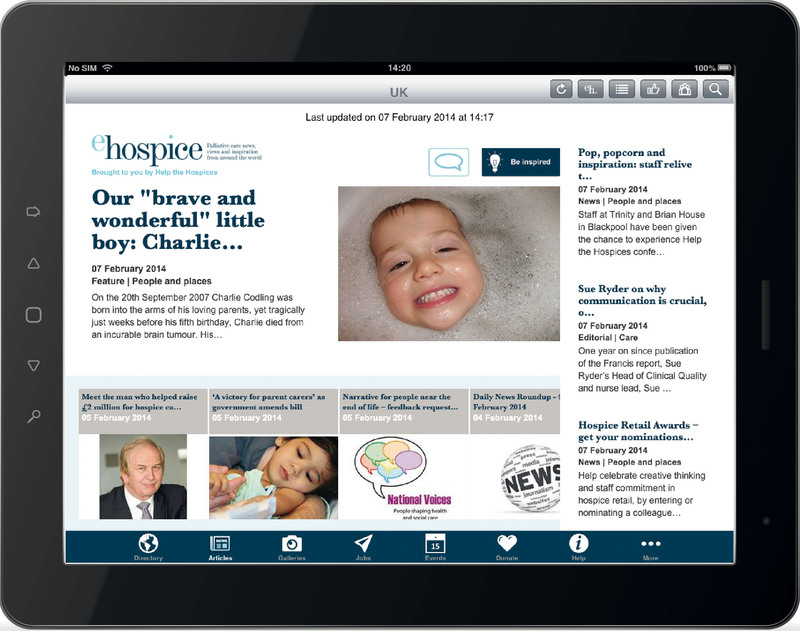 And so began the development of ehospice, a new website and app for an international audience, aimed at revolutionising the way people access news and information on hospice and palliative care, and ultimately helping to improve patient care. A vibrant network for the sector. At a meeting in London, we consulted with fellow members of the Worldwide Palliative Care Alliance (WPCA). Nine other organisations, from around the world, committed to running an edition of ehospice. We engaged an agency, HeadChannel, to deliver ehospice. They were tasked to design both the website and app in a simple yet innovative way. We wanted readers – be they busy professionals or members of the general public – to be able to find and access all the most relevant content easily, when it suited them, at the click of a mouse or swipe of a screen. So we arranged the key information into clear categories – care, community engagement, education, policy and research – and allocated separate pages for events, photos and job listings. We also attributed tags to each article to maximise the search facility, and made content shareable via social media and email – which, as well as spreading the word, significantly helps to drive traffic to the site. Content featured on the site covers a wide spectrum of areas, including the latest palliative care research, inspirational stories from patients and staff from around the world, examples of good practice and innovation in the sector to help improve the quality of patient care and educational opportunities. Another important feature is a directory of hospice and palliative care providers worldwide, which can be accessed via an interactive map, or a ‘spinning’ globe in the app. Unsurprisingly, in making our vision for ehospice a reality we faced a few challenges during the development. Creating both a website and an app simultaneously meant we had two major projects on our hands and we had to make sure the website was compatible with smart phones and different operating systems. Help the Hospices is responsible for the overall maintenance of ehospice (as well as managing the content for the UK edition) and the other participating organisations run their own editions. The need to create content to cater to different audiences was a further challenge: the material had to be engaging to health professionals without being beyond a layman audience. We found a way of negotiating this potential problem through issuing guidance to contributing authors and through our own internal training for content editors. The site’s reach and popularity are continually growing. The website alone gets more than 40,000 visits a month, and there have been over 1.2 million page views. People can subscribe to alerts, which include links to articles and other useful information. Currently, there are 3,000 subscribers. It continues to grow, with an American edition launched last year and plans for a Latin American (Spanish) edition. We are also exploring the development of editions for China and the Asia Pacific. Through ehospice we have helped make communication and information-sharing between palliative care professionals in the sector much quicker – and the world for them that little bit smaller. As head of publishing, Daniel is the project manager for ehospice, overseeing its strategic direction and the maintenance and development of the platform. Prior to joining Help the Hospices in 2003, he worked as a research and circulation manager at a pharmaceutical magazine publisher, and as a media monitor for Durrants Media Monitoring Service.